Increased boat traffic for construction and maintenance is a concern when it comes to the installation, operation, and decommissioning of offshore wind turbines. Although there has been a lot of a concern with the impacts of boat traffic on larger organisms such as sea turtle and dolphins, there has been little attention on smaller species such as copepods. Recent studies though have shown that their populations could be drastically decreased by boat turbulence. When examining samples of water from an area with very little boat turbulence 5% of the copepods were dead. Areas with very high boat turbulence had up to 34% of the copepods dead. 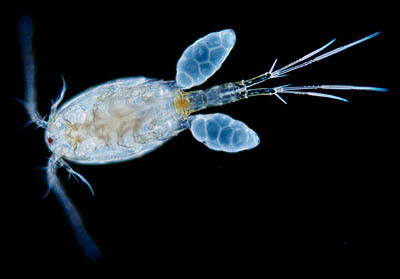 Copepods are towards the bottom of the food chain and a severe drop in their population could affect populations much higher in the food chain (Bickel).